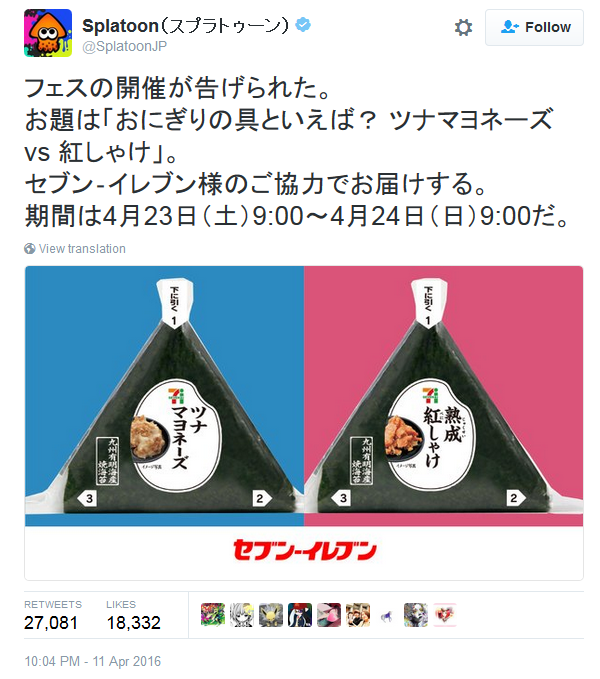 ...It's a 7-Eleven onigiri contest? No matter where you look in the world, Splatfest is sponsored by some corporation or another. No philosophy or preferences. It's not even a stupid thing like we'd get in the Everybody Votes Channel. It's product advertising and shallow market research. At least we had a Transformer write about the Autobots vs. Decepticons Splatfest. And at least the Pokémon Red vs. Blue/Green Splatfest was within Nintendo, and revealed that The Pokémon Company could be reasoned with. And I got pretty passionate about that Splatfest, too. You want me to get passionate about onigiri? Especially from 7-Eleven? 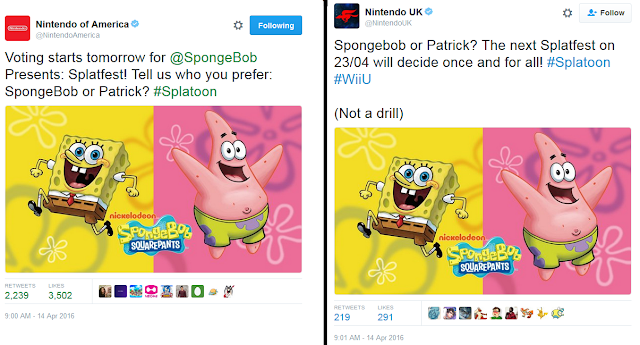 I'm sure a company would love for another company's fans to try to get excited and meme-ish with the first company. C'mon, where's the jelly-filled doughnut option? As for SpongeBob vs. Patrick? I really, really, don't care. I'll vote for Patrick, if only because I like the Push it Somewhere Else Patrick meme. There was a really good one I saw in 2012 and I've been associating Patrick with that ever since. Screw SpongeBob. I don't think Splatoon is sponge worthy, so let's go with Patrick Star. Ludwig didn't watch Nickelodeon as a kid because he didn't have cable. Now he does, but it's mostly to watch Fox News. What a miserable guy he is. He watched a lot of The WB Television Network on his antenna TV. Ludwig won't retroactively update the Splatfest results Excel charts he made a few weeks ago with the results of this Splatfest. The next Splatfest happens to be a good idea without sponsorship. If we are going to have Splatfests based on cartoon characters we should have it based on the classics. Bugs Bunny vs Daffy Duck, Tom vs Jerry, Road Runner vs Wile E. Coyote, Foghorn Leghorn vs either Barnyard Dawg or Chicken Hawk, Sylvester vs Tweety and there are probably others I have not even mentioned yet. Nintendo could make a sneaky Bugs Bunny vs Mickey Mouse Splatfest by making it Rabbit vs Mouse as Warner Bros and Disney will demand too much for both of them to be on board. These characters have contrasting dynamics that people may greatly prefer one over the other instead of Spongebob vs Patrick where their personalities are very similar. My husband can make great Spongebob character impressions. I won't be available for this Splatfest so I may vote just for 2-4 snails you get by merely voting/staying in the fanboy/fangirl rank. I thought a bit on how to respond to this and... uh, I don't know. Maybe they really, really want to subvert the Popularity vs. Wins thing by making it unpredictable? Or maybe it's supposed to be a proxy for hero vs. sidekick? ...Mildly, but not to the point where I found it worth interrupting me listening to Fire Island Volcano from Pokémon Super Mystery Dungeon. Excellent theme to be listening to. I should listen to it myself now. ...So I assume you listened to it. I kind of feel bad about how the KoopaTV GOTY 2015 awards went. Poor PSMD didn't win anything. Leave it to LudwigVonKoopa to hate on something out of the ordinary. Wot's with the random lack of spaces? Uh... what's out of the ordinary here? ...So the whole post is spam? Maybe there's only so many ideas for splatfest teams? There are many ideas for Splatfest teams they could've done. Reminder that they had these "this or that" polls in the Wii's Everybody Votes Channel for years as a consistent clip.